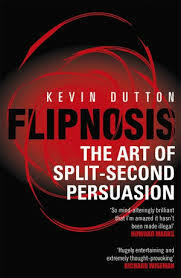 Dutton has looked into a great body of research and case studies and set himself the task of distilling the elements which, if combined judiciously, can help one persuade others instantly. I do not know whether people can master this art, but the principles he comes up with are certainly interesting: he has identified 5 of them (acronym: SPICE! ): a) Simplicity: simple messages tend to be more persuasive. b) Perceived interest: recipients of a message subconsciously ask themselves ‘What’s in it for me?’ c) Incongruity: surprise means people notice the message and noticing is a precondition for persuasion. d) Confidence: confidence convinces. Period. e) Empathy: you are more likely to persuade others if you are seen to be (or to have been) in the same boat. e) Lecturing students is often counterproductive; instead of telling them what to do in order to improve their vocabulary for example, why not share with them the strategies you used when you were learning, say, Spanish?